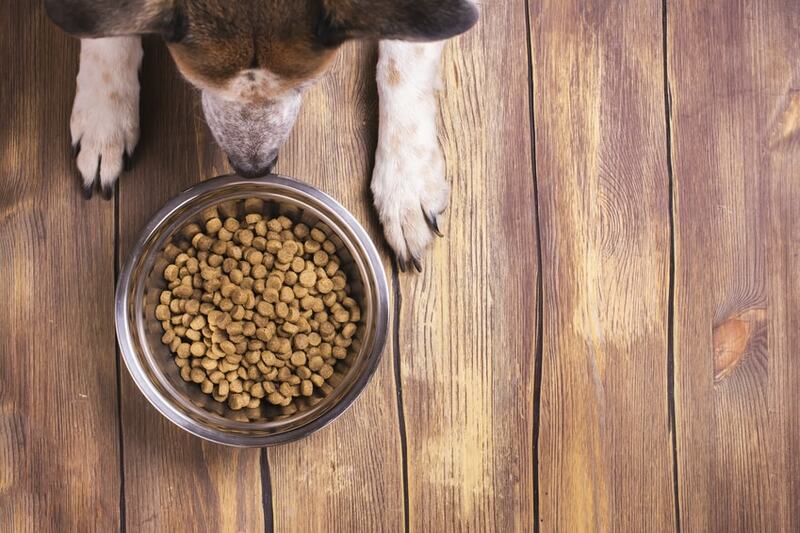 There are some good reasons why you might want to feed your dog a raw diet instead of a commercial kibble or canned food. Raw food is less processed. It doesn’t contain the preservatives and other additives found in kibbles and canned foods. It normally has more meat (and organs) which are good for dogs. And, raw diets usually have few carbohydrates. All of these points make raw food diets beneficial for dogs, as long as they are nutritionally balanced. There are different ways to feed your dog a fresh raw diet. If you want to prepare a raw food diet for your dog yourself, you can feed raw meaty bones as part of the diet. This kind of diet includes organ meat, muscle meat, eggs, dairy, vegetables, fruits, and even some grains. The diet can be tailored specifically for your dog, depending on his needs. Some people like to use a prey model diet that tries to mimic the diet of the wolf in the wild. It focuses on large chunks of meat with small amounts of bone, some organs and eggs. If you are interested in feeding the prey model diet you should read about it and understand it fully to make sure your dog is receiving all of the nutrients he needs. Talk to people who feed these diets and get some advice, especially about supplements. Making and feeding your dog a raw food diet yourself does have some drawbacks. It can be expensive to buy meat and organs unless you buy in bulk, which means you likely need freezer storage space. Some people invest in a grinder for meat and bones – also expensive. Feeding raw can be messy. Bacteria can also be a concern, such as Salmonella, though if you keep your kitchen clean, it shouldn’t be a major issue. Salmonella is usually more of a concern for humans handling raw meat than for dogs. If you don’t have time or the inclination to prepare raw food yourself, you can also buy pre-made raw dog food. We’re not talking about freeze-dried raw or frozen raw. Some people sell fresh raw food for dogs. In New York and San Francisco, for example, you can go to some butchers or raw dog food specialists and ask for a pre-made raw dog food. It’s expensive but it’s good quality raw food. Walk in or place an order and buy the fresh raw food for your dog, already prepared. You can also order raw meat and blends from Blue Ridge Beef and similar establishments. They have Premium Blue Ridge Beef, a 100 percent natural raw food for pets. They use Sojos as a mix with their beef. Along with their raw beef dog food, you can also order green tripe or other raw foods from their site. If you don’t happen to live in an area that has raw pet food on demand or an obliging butcher, it’s hard to find companies that make raw fresh pet food. Most raw dog food companies make their raw foods in raw frozen or freeze-dried form. That’s the most logical way for them to handle the food for shipping and storage purposes. Primal has raw frozen and freeze-dried diets, as well as raw meaty bones. They also have frozen meat mix rolls. Steve’s has raw frozen and freeze-dried diets, along with beef marrow bones for recreational chewing. Bravo has raw frozen diets, freeze dried foods, pre-mixes for raw diets, and blends. These companies are all well-known and they have good reputations with people who feed raw. Darwin’s, BARFWorld, K-9 Kraving, Pets 4 Life Pet Cuisin, Raw Bistro, and Stella & Chewy’s all offer complete and balanced raw frozen food and/or freeze-dried raw food diets. Freshpet can be found in the refrigerated section of grocery stores and pet stores. They have slice and serve rolls. This company appears to be growing quickly. A few years ago they had just three refrigerator products and now they have an entire line-up of products. “In 2013, Freshpet opened a new manufacturing facility, the Freshpet Kitchens, located in Bethlehem, Pennsylvania. This new $25 million facility was built to resemble human-grade manufacturing standards. All Freshpet food recipes are manufactured in this facility.” According to Freshpet, their foods are cooked at lower temperatures so they are not truly raw but they don’t really fit in any other category at this time. These are low-processed foods. In figuring the dry matter basis for these rolls, we suggest treating them like canned dog food. The guaranteed analysis for the rolls resembles canned food. Most raw dog foods today are conveniently available in raw frozen or freeze-dried form. There are several good companies making these foods and you can buy from them with safety. Raw dog food companies do have occasional recalls but you should be able to buy these foods with confidence. Any company can have a recall once in a while. It should not discourage you from ever feeding your dog any raw dog food from a company. Check the company, the food, and their overall reputation. If you like what you hear about them, give it a try. It can be more difficult to find raw fresh dog food locally unless you live in a big city with a butcher or specialist raw food maker nearby. You may want to try making your own raw food for your dog. It’s not as hard as you might think. There are some benefits to feeding raw and many dogs love a raw diet. If you’re interested in feeding a raw food diet to your dog, we suggest checking out some of the good online groups dedicated to raw feeding. Their members can provide you with plenty of information and tips on getting started. For more information about raw dog food resources, we recommend the Dogaware.com site.